It is late afternoon and after some hundred paces the sun appears above the crest of the rise. Looking up at the blue sky and then at your mother’s face you break the silence asking her if it is not in reality much more distant than it appears. The sky that is. The blue sky. Receiving no answer you mentally reframe your question and some hundred paces later look up at her face again and ask her if it does not appear much less distant than in reality it is. A painting by Freya Douglas-Morris begins somewhere between memory and alienation, the landscape at once all too familiar and yet estranged from her surroundings. Colour and depth work together to help burrow the viewer deeper into each scene. Despite being grounded with far reaching plants and trees, the paint bleeds and stretches across the canvas as if it could keep going, will never dry and hence never bring each sprawling reverie to a close. A disturbing, slightly distorted sense of scale reminds the viewer of when, as a child, everything seemed either too large or intangible — echoing Beckett’s adolescent uncertainty and the attempt to gauge whether something is much more or much less than what in reality it really is. These paintings are a further reformulation of the question of how things seem—glistening, dull, energetic, relaxed, crude or naive—in relation to how we may want to awkwardly articulate them: that urge to locate and stabilise our environment. The title of Douglas-Morris’s show The Sun Long Night is a line adapted from Fern Hill, a poem by Dylan Thomas, in which the poet reflects on the ‘lamb white days’ of his youth. Douglas-Morris’s compositions are similarly imbued with childhood memories, evoking different textures and emblazoned with patterns from a distant time and place. The sun growing longer has both visual and temporal consequences; length presupposes a spatial distance in order to be measured, while the elapsing light creates a depleting sense of time. In one painting, Douglas-Morris presents the Tree of Childhood, wherein a contemplative figure sits beneath what looks like the trunk of a silver birch and gazes into the mountainous distance. The tree’s branches and leaves are noticeably distinct from the rest of her palette: this marks a designated zone for depositing miscellany such as shells, flowers and glass,which will eventually become weaved into the panels of a piecemeal, faux-naif tree. This is either a reference to the way that children actually view trees—incoherent, of many different parts and shades—or a symbolic representation of a child’s early years,an innately formative period of time, resisting and exploding into the atmosphere. The Sun Long Night is at once locatable in childhood memory, where things are either compressed or untenable, and in the more mature contrivance of trying to unify circuitous thoughts. Awash with eventide, either actually at night or if not, at dusk, these works explore changes in brightness, colour and visibility as a way to fathom nocturnal activity, ordinarily kept in shadow. That is, each painting creates the feeling that the viewer is looking onto an otherwise private scene. Two silhouettes are submerged in dark purple water, enmeshed by the light of afternoon, while other people are shown sunbathing on a beach in the distance. In remembering dreams we may be haunted by the misalliance of contradictory sights — how could it be both night and day at once? — and yet, whilst still asleep dreams can seem ordered, even justified in appearance. In Thomas’s poem, memories take on dream-like qualities as he repeatedly attempts to describe how a particular day, light or colour from his childhood looked: ‘it was lovely’, ‘it was air’, ‘it was all/Shining’, for instance. 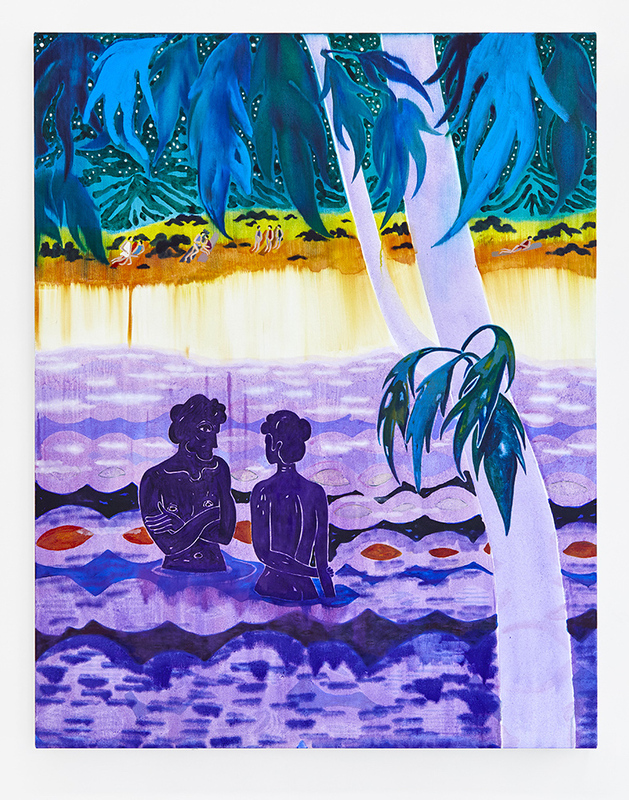 Douglas-Morris is similarly emphatic in her repetitious lines and phrasing—the water surrounding the two figures is a dark mood of indigo and it reflects and repeats the central figure’s eye, which is doubled by the watery, almond-shaped ripples. Although we may conclude that these paintings contain highly elaborate, impossible scenarios, each one is an attempt to show, and in many ways perform, how the materials of memory form the basis of imaginative play. Douglas-Morris forms quick marks using thin layers of paint and her characters are defined by their relation to negative space: the relative lack or absence of paint in places. These paintings begin on paper as miniature versions of themselves, but expand and grow into their new setting—in this way, Douglas-Morris revises certain features, heightening and reiterating their importance. In the same way that Beckett’s sentences seem to negate one another – his twinned questions broken by the need to understand their own purpose – Douglas-Morris’s paintings further add to, rather than resolve, an issue. She is working out a distance, an imaginary space.